Meanwhile, you should be gathering your supplies. 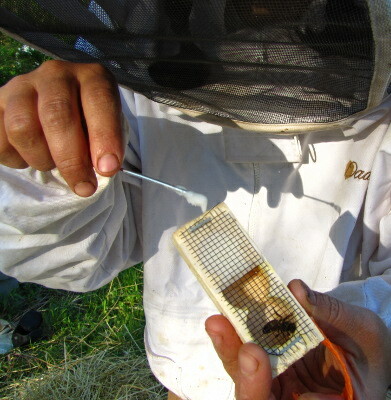 All you really need to hive a package is a hive tool and a nail or piece of wire to puncture the candy in the queen cage, but you might find some other equipment handy. Bees in a package are very gentle, but they're also confused and will land all over your head, hands, and arms. I recommend wearing a veil at the least, and you might feel more comfortable in a full bee suit. If you're able to allow bees to settle on your bare skin without batting at them, this is one procedure that works much better without gloves, but go ahead and wear hand protection if you're going to be nervous without. With your tools assembled, take another few minutes to prepare your hive. 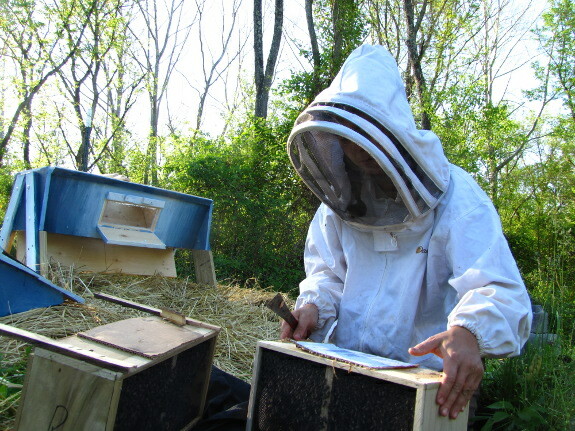 Each type of hive is prepped differently, and I'll cover the specifics for Warre hives and top bar hives in later posts. If you're installing a package into a Langstroth hive, I recommend doing a little additional research to find out those details. 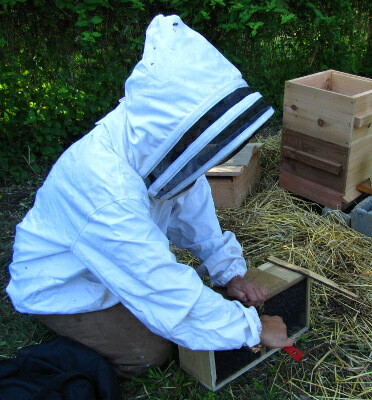 At its most basic, hive preparation consists of making a space into which you can pour bees. Now you can start to pry your package apart. If you ordered more than one package and they were mailed as a single unit, use your hive tool to separate the packages. Next, pry off the cardboard or plywood cover on top of one package, as is shown above. Underneath the cardboard or plywood lid, you'll see the top of the can of syrup. 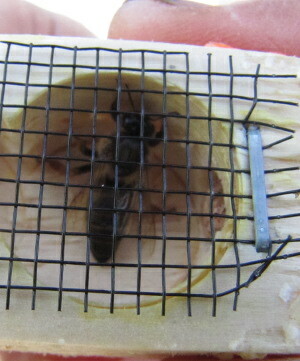 There will also be a strap --- either fabric or thin metal --- that attaches to the queen cage. It's very important that you don't knock the queen cage off this strap and that you don't let the queen cage fall into the package of bees. Both mistakes can be remedied, but beginners will do better to prevent them. If the strap is metal, you should be able to pry it loose from its staple, but I had to cut my fabric strap. I was careful to leave enough strap that I could hold onto the remainder while pulling out the can of syrup. You'll notice that you really need three hands for this procedure, but you'll find a way to make do with two. 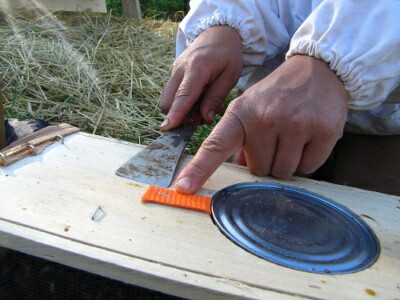 Using the hive tool, pry at the top of the can of syrup until you can get a grip on it. Then hold onto the queen strap with one hand while pulling out the can of syrup with the other. What you should be focusing on now is the queen cage. If the weather is chilly, brush off attendant bees and stick the queen cage in your pocket until you're ready to deal with her. If it's warm, just set her aside while you get the tools for the next part of the procedure. But don't lose her! 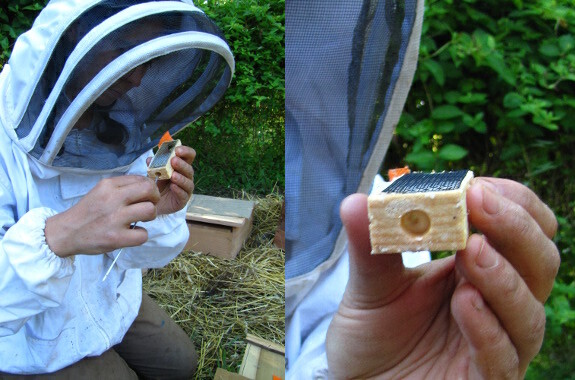 You'll notice that the queen cage has corks on two ends, one of which leads directly into the queen's living area (right side of the above photo) and the other of which goes into the candy plug (left side of the above photo). Beginners should leave the cork on the living area side alone and instead focus on removing the cork that leads into the candy. You can take out the cork with anything you want. 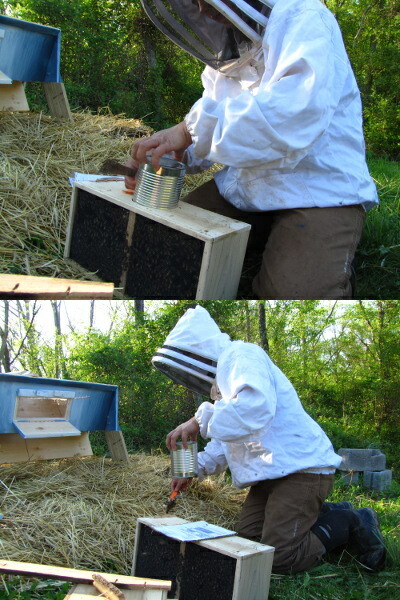 Pros often use the corner of their hive tool, but I found it much easier to spear the cork with a piece of wire and pull it loose. Underneath the cork is a plug of candy. You want to make a hole in the candy large enough for the queen's scent to waft through, but not so large that the queen herself can crawl out. The queen should have to chew for a day or two before she can escape. To get this effect, pierce the candy with a nail or wire. Be careful that you don't skewer the queen! The candy in one of my queen cages had partially melted (see the photo on the right). It's not the end of the world if your hole doesn't really work --- you can let the queen out in a few days if she hasn't escaped on her own. Where you put the queen depends on what kind of hive you're using. 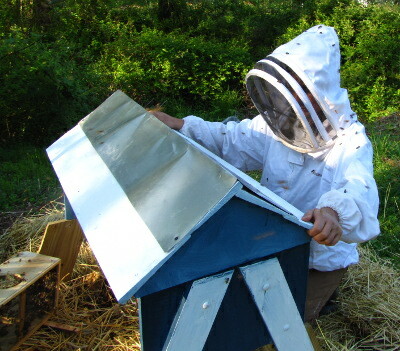 Do a little research on your own or read my posts about top bar and Warre hive installation (coming soon for those reading this post as I write it, or linked at the bottom if you're reading this post later). I'm assuming you've installed the queen before you move on to the next step below. 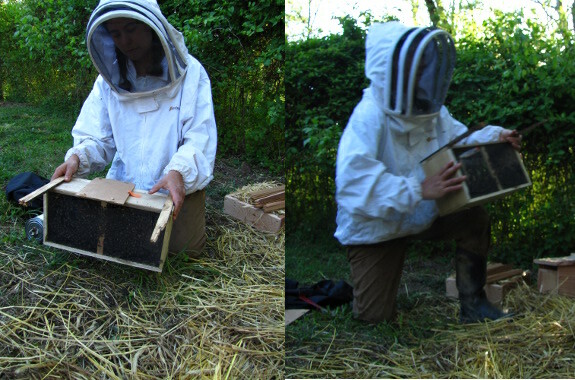 Now for the fun (read: scary) part --- pouring the bees into the hive! 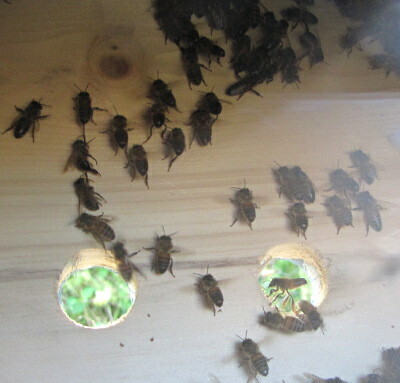 Bees in a package tend to cluster near the top, and you want them loose and pourable. If you're scared of your bees, spray them with sugar water now (but that's not really necessary --- I didn't). 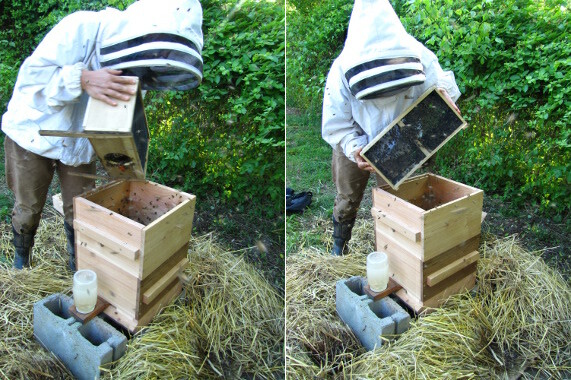 Next, tap the box of bees solidly on the ground to knock them loose, take off the lid, then quickly upend the box over top of the open hive. Pouring worker bees out of a package takes a bit of skill. 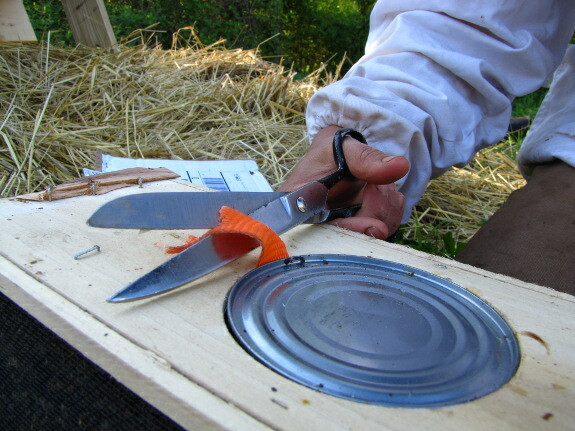 You'll end up tilting the box from side to side so bees drop out the entrance hole, and you'll probably stop several times to tap the box again and knock bees loose. This is when bees will fly all around and scare you, but remember that hiveless bees are gentle and very unlikely to sting. The bees stuck in the package are more problematic. 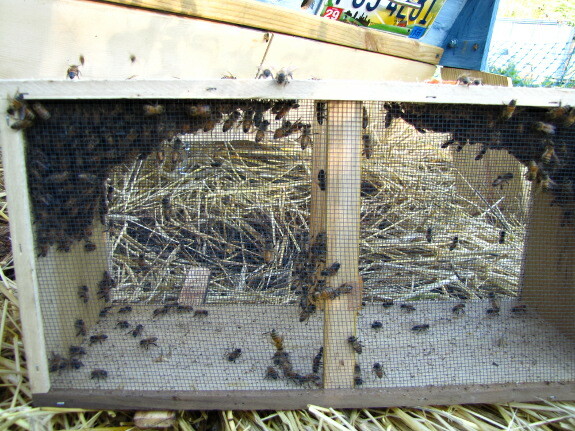 If you're a better thumper and shaker than I am, you might get them all out the first time, but I find that it's easier to wait until ten or fifteen minutes after the hive has been closed up and everyone has settled down, then to come back and check on the package. Chances are, you'll see bees clustering in the upper corners, as in the photo above. A couple of thumps and shakes are all it takes to knock most of the remaining bees out onto the ground, which will make it easier for the bees to find their way to the hive. 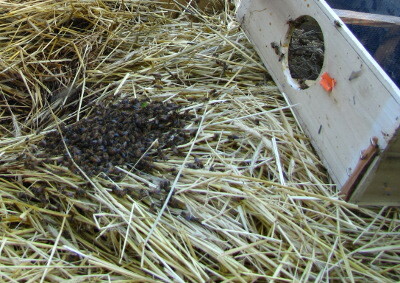 Place the package in front of the hive, hole-side-up, and nearly every bee will be in the hive come morning. 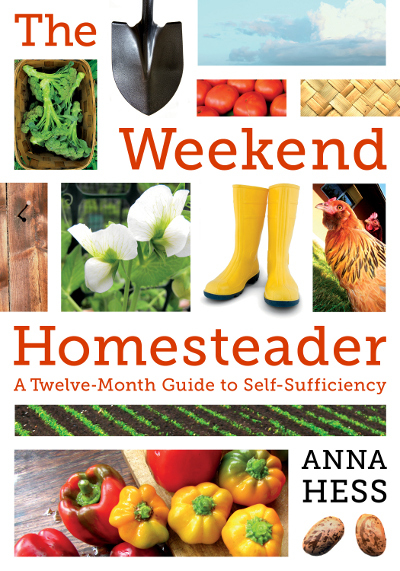 Weekend Homesteader is full of fun and easy projects to help guide you onto the path to self-sufficiency. What is a package of bees? Anna, Every package I've ever seen included several attendant bees in the cage with the queen. I can't see any attendant bees in your photos. I was told that the attendants help pass water to the queen and reduce the chance of absconding (as you mentioned, you have 10,000 unrelated bees, so a few attendants may not make much difference). We always get local swarms and I have never had a swarm abscond. David --- We've only done packages once before, and those packages did come with attendants in with the queen. I didn't know whether it was odd that this one didn't or that that one did.... Maybe I should contact the company and ask about that. I just installed two packages this weekend. The queens had no attendants. The packages were from a supplier from California. 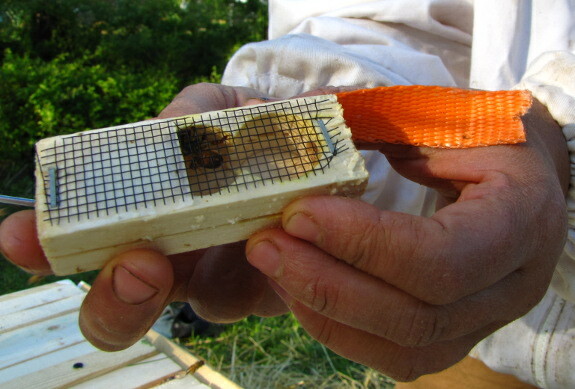 I think the bees can feed the queen through the screen on the cage. My post about installing the packages is here.